You can create vector drawings easily then export transparent PNG format with edraw to make your images stand out. Transparent Portable Networks Graphics (PNG) images enable you to make certain aspects of an image transparent and easy to insert in other programs. Edraw offers a set of vector drawing tools that can rival a professional illustration program. Besides, it knows what makes a diagram different from a drawing, and helps you create amazing diagrams quickly and easily. 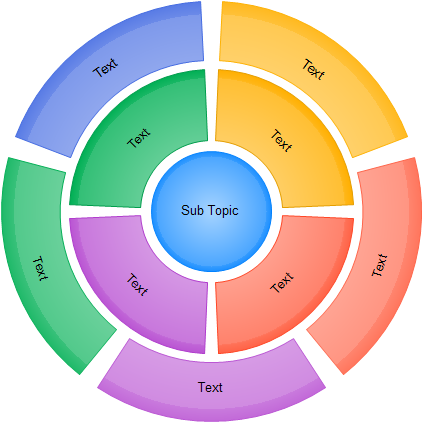 While you are creating the flowchart, network diagram or organizational chart, you may not need the background color. Transparent PNG format is a good choice to insert in PowerPoint and MS Word document. 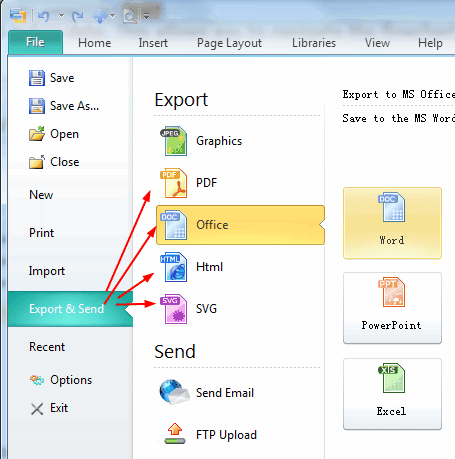 Click the File menu, then click the Graphics item in the Export & Send option. The Save As dialog box will come up, type the file name and choose the PNG Format. Click Ok.
To save the page or shape with the original size, click Original size. To save the page or shape with zoom size, click Use zoom and select a zoom factor you want. 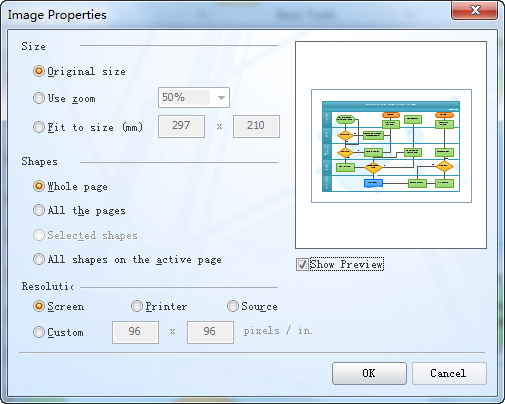 To save the page or shape with special size, click the Fit to size and type the value you want. To save the active page, click Whole page. To save all the pages in the document, click All the pages. To only save the selected shapes, click Selected shapes if you have selected a shape. To save all the shapes in the active page, click All shapes on the active page if you have selected shapes. Note: You can see the content to save in the preview box. The PNG format was designed to replace the antiquated GIF format, and to some extent, the TIFF format. It utilizes lossless compression, meaning no image data is lost when saving or viewing the image. It is a universal format that is recognized by the World Wide Web consortium, and supported by modern web browsers. What PNG offers is called the alpha channel. An alpha channel is one byte of extra data per pixel (or palette entry for 8-bit images) that represents the transparency level of a pixel. A PNG image with alpha is capable of 256 levels of transparency. What does all this mean? For one thing, you can anti-aliasing text and images so that sharp curves look good against any background. You can apply a true drop shadow which fades into the background. You can create images that take any shape or form. There are many possibilities with alpha transparency.